Have you ever wanted to step back in time? To see Hawaii what it was like before contact, to hear the spoken language, see where they lived, what they wore, and what they ate? Well, thanks to an amazing group of ‘landkeepers’, you can. 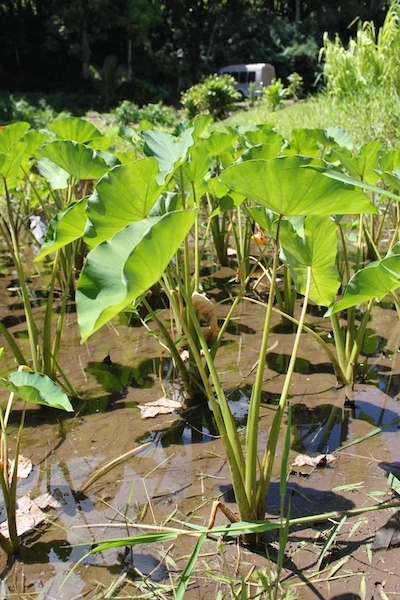 The Maui Hawaiian Village opened up to the public earlier this summer, and what started off as a land rehabilitation project, of removing invasive plants and planting natives, has turned into a ‘living history’ tour in the West Maui Mountains. I was invited to join one of these tour groups last weekend to see what this tour was all about, and I jumped at the chance. 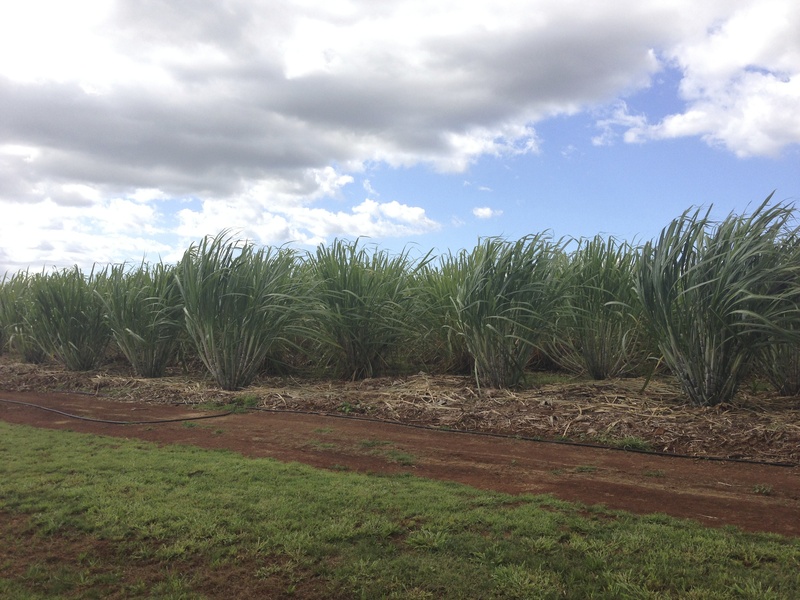 Due to the delicate nature of the location, we all were to meet our first tour guide and driver in Kahului. We were then told where we were going, and explained why the location of the tour is kept quiet (to access the tour the bus drives through a small neighborhood. The tour bus stops (not too far from Kahului) at a kalo (taro) patch, that is the beginning of our short hike into the valley. 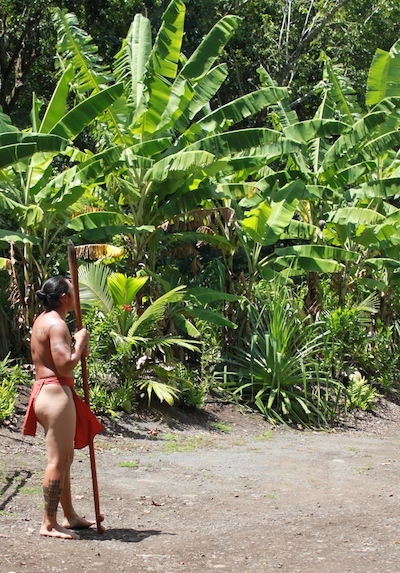 We are introduced to two more tour guides (landkeepers they like to call themselves – reminding us they are not professional ‘tourguides’) as well as the seventh generation keeper of the kalo patch that we are standing next to, whose stories of the land are sure to give ‘chicken-skin’. Upon entering the valley, the landkeepers offer a traditional ‘oli (chant) to ask permission to enter the village. More landkeepers, complete with keiki (children) come out of the hales (shelters) and welcome us into their village. We were on the shorter tour, the ‘Aina Tour, which focuses on the main three necessities of live for the pre-contact Hawaiians – Food, Shelter and Clothing. The hale are surrounded by native plants, and just as one starts drooling over all the tropical fruits, we are offered beverages and cut up pieces of papayas and bananas. I won’t give away everything about the tour (and besides, you can read more about it on their website) – but what does quickly become obvious is this is more than just a job for our landkeepers. They share personal stories about the resurgence of the Hawaiian culture, for example how just a generation ago it was illegal for children to speak Hawaiian in schools, and now their own children are able to attend Hawaiian immersion schools. Each landkeeper kept coming back to two points – one is sustainability. Sustainability is a pretty big buzzword these days, and as our guides pointed out, Hawaii was 2,500 miles from the nearest land-mass, they had to be pretty conservative with their resources. The other point was coming back to ones roots. As the landkeepers were clearing the valley over the last two years, the unveiling of ancient aquaduct walls and taro valleys seemed a great metaphor for their journey. 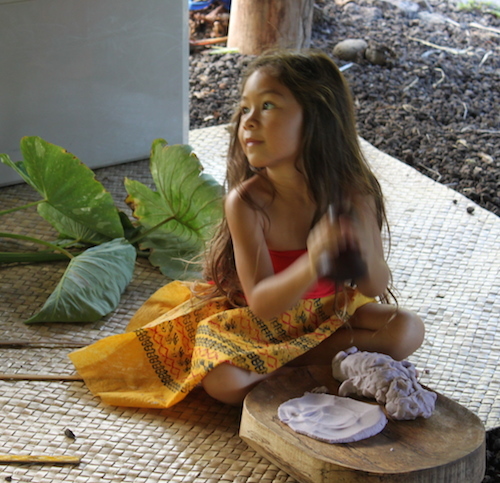 Words, plants, practices and values that have been hidden or lost since the Western contact are just starting to be found and put to use again, and sharing this with each other, with our guests and with our keiki… it seems like the beginning of something very exciting…. there goes the chicken-skin again! 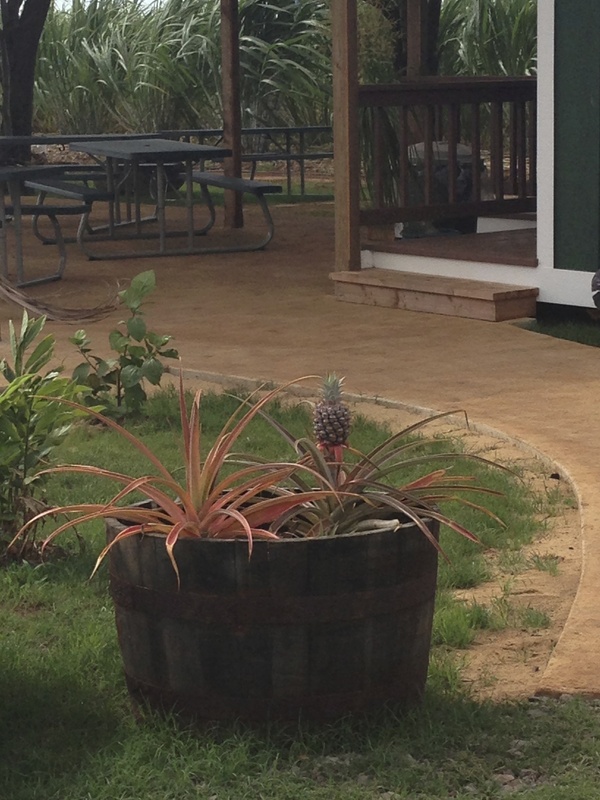 The ‘Aina Nui Tour is 4 hours including transportation, the ‘Aina Tour is 2. School and Kama’aina rates are available. Tours are currently offered a few days a week. See the Website for booking or more information. Follow Maui Hawaiian Village on Instagram and Facebook for the Olelo Wednesday Word of the Day and the Aloha Aina Friday Plant of the Day and more! Miranda Camp is offering another option. A naturalist, adventurist, and self-described ‘amassador of fun’, she will take you and your friends and family on a private tour of your design. After years of being an informal tour guide to her own friends and family, Miranda decided to make a business of her natural talent – delighting visitors with the hidden treasures of Maui. She recently started her company, Maui Mana Adventures, and specializes in Hikes, Stand Up Paddling and Snorkeling Tours. See Maui’s underwater world and its amazing creatures – with great narrative along the way! 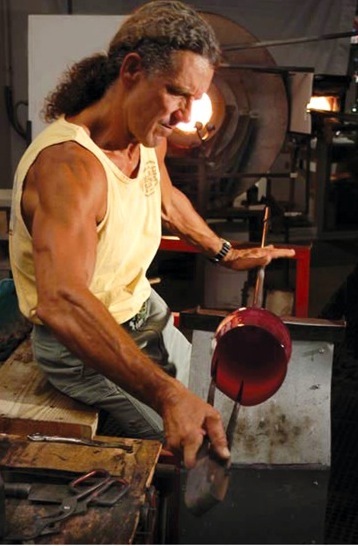 Maui Made: How did Maui Mana Adventures start? Miranda Camp: I’ve been taking people on adventures in Maui for many years and one day a friend said to me “You should do this for a living because you’re so good at it!” It’s what I love to do more than anything else so it was shocking to me that it hadn’t occurred to me before. 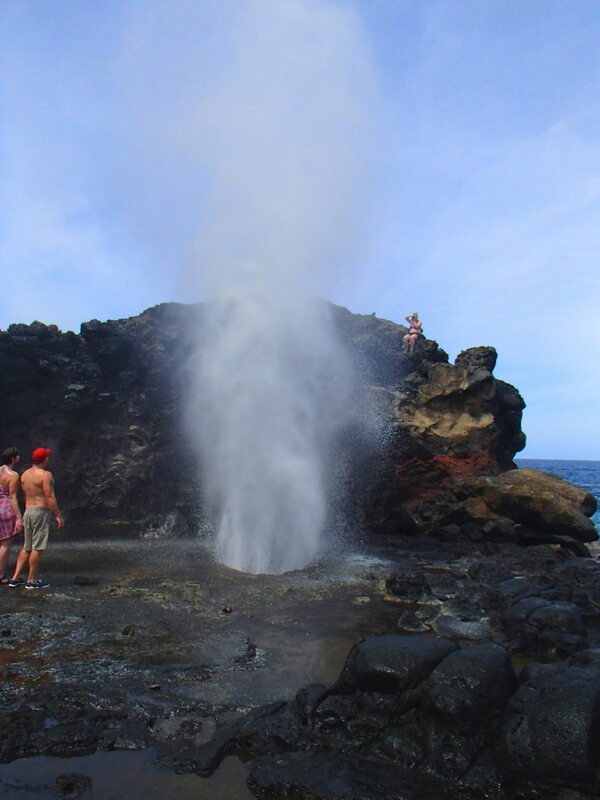 MM: What’s your favorite adventure on Maui? MC: There are so many great adventures on Maui, but I think I love my Island Loop Adventures the best because they are a combination of various adventures all in one day. We tour either the West Maui mountains, Halemahina, or the East Maui mountain, Haleakala, and fit in as many adventures as we can. It’s such a blast! 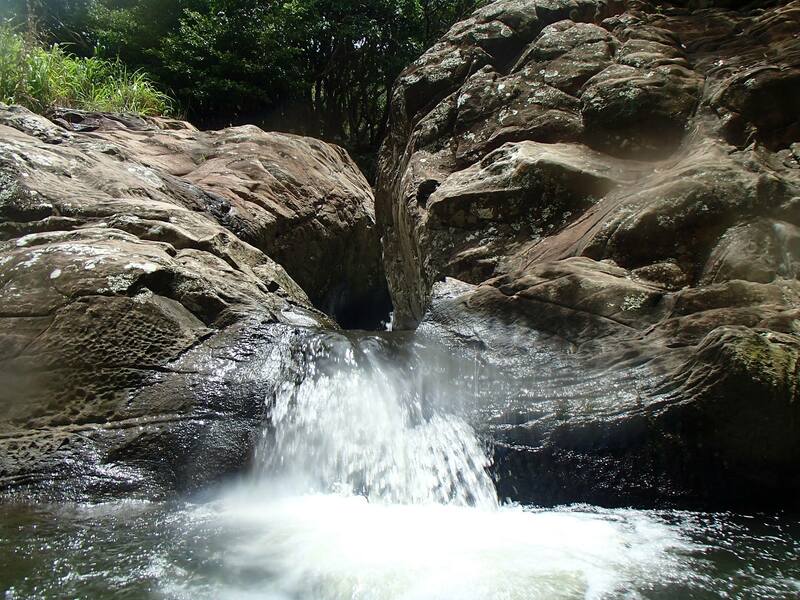 the natural amusement park of Maui – a slide! 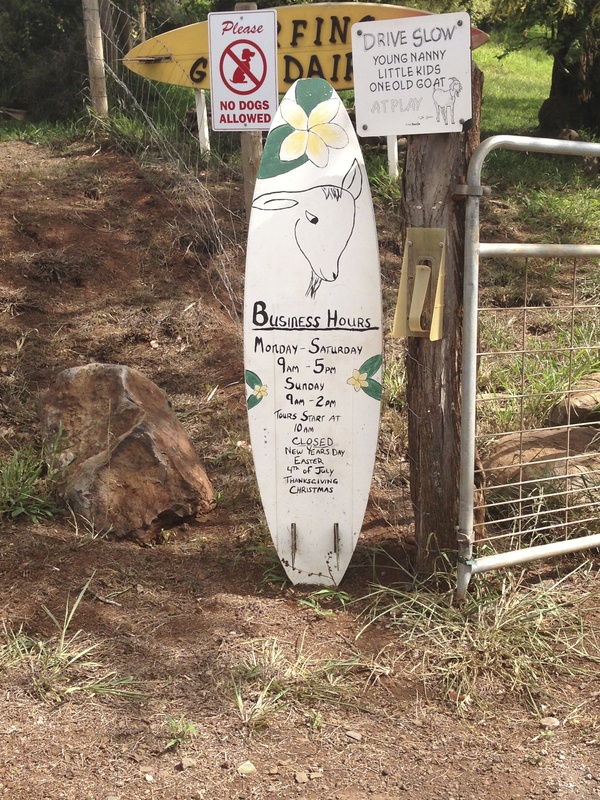 MM: Anywhere on Maui you haven’t yet been? MC: I’m sure there are special places on Maui still undiscovered by me. I’m working on finding them all. MM: What sets Maui Mana apart from other tours on Maui? Every company has it’s own unique niche. My company is all about sharing the aloha and special Mana (which is Hawaiian for ‘life force energy’) of Maui. I specialize in private custom tours, so my clients design their own adventures. They tell me what they’d like to do and see and we do it at their pace. I’ve been studying everything I can about Maui from amazing people since I fell in love with it and moved here over 16 years ago. I have lots of enthusiasm and respect for the island and it’s Hawaiian culture and I love to share that with others. MM: What are your favorite places to explore around the other Hawaiian islands? MC: All of the islands are so unique and special. There are too many favorite places to name and I’m still learning. MM: why do you think ‘ecotourism’ vacations and activities are so popular now? Not only will you have Maui’s best tour guide, you’ll have a friend for life. She’s worked as a Naturalist/Educator for The Hawaii Nature Center, the Pacific Whale Foundation and now with the Maui Ocean Center Aquarium for over 10 years. 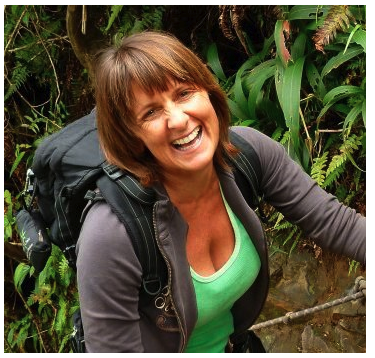 She has lead hikes for The Nature Conservancy of Maui and the Maui Sierra Club and volunteers for the Coastal Land Trust, Auwahi Reforestation Program, The Hawaii Wildlife Fund Hawksbill Sea Turtle Recovery Project and more. Safety is important to Miranda: she’s First Aid/CPR Certified. To see what others are saying, check out the reviews on Tripadvisor. Omaopio Road, which connects Kula to Puunene, didn’t have much reason to see visitor traffic, unless you had a particular interest in fancy goat cheese or adorable baby goats. Now, in addition to Surfing Goat Dairy, Omaopio Road is now also a destination for vodka connoisseurs! 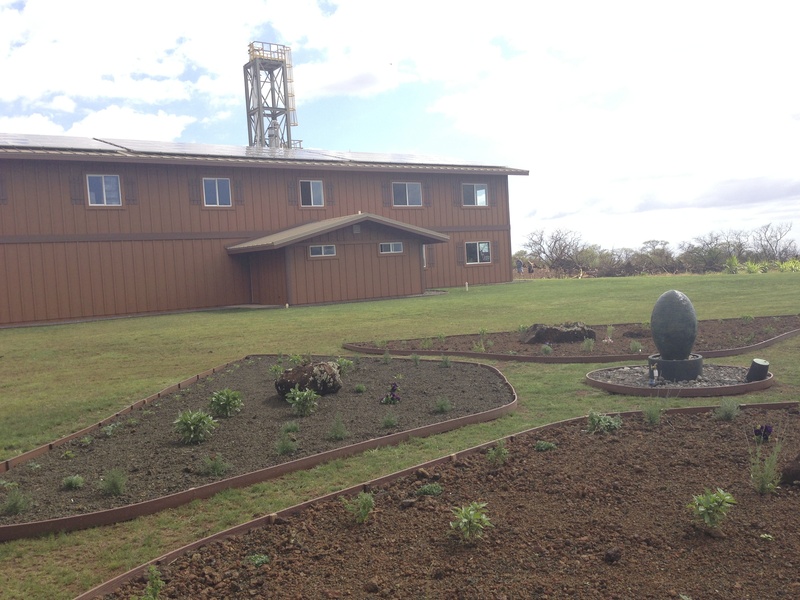 In April, Ocean Vodka, the number one selling ‘made in Hawaii’ spirit, opened a brand new Organic Farm and Distillery, with tours available several times a day. I arrived too late for the tour, but the gift shop is open to the public currently during tour hours, from 9-4 daily. There’s a few logo items available for purchase, and some vodka of course, but according to Danielle, the very friendly shop employee, in a few weeks it should be full of some great made on Maui finds! I’ll check it out and report back. 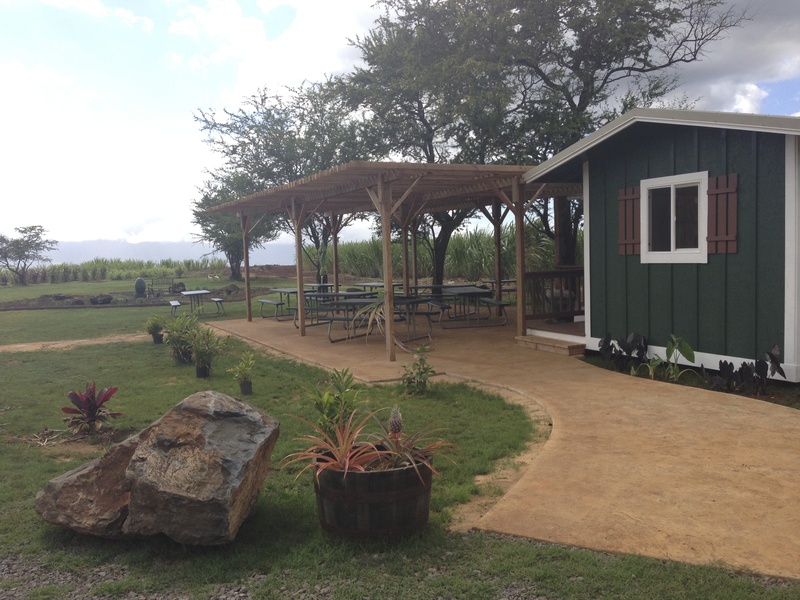 Tours of the organic farm and distillery are available daily at 9:30, 10:30, 11:30, 1:00 and 2:30. Tours are $10 a person or $25 includes lunch. To schedule your tour you should contact Ocean Vodka here , or just drop by and see if there’s space available! Just up the road from Ocean Vodka is Surfing Goat Dairy, where you can purchase goat cheese, check out the baby goats (there always seem to be some babies there! These goats breed like rabbits! ), and yes, take a tour! Surfing Goat Dairy actually offers three types of tours, a casual tour with no reservations necessary, for $10/adult and $7 kids, evening chores and milking tour, Mon-Sat at 3:15 for $15/a, $12/k, (reservations recommended) and a grand dairy tour for $25 on selected Saturday mornings, which includes milking a goat and sampling many cheeses! I haven’t taken a tour yet, but it’s a nice, casual place where you can hang out and enjoy the goats, and if you linger long enough, you can get some good info! According to yesterday’s overheard conversation, the dairy mixes too particular types of goats (and probably more) – one that produces lots of milk, and one that produces milk with a high butter-fat content. 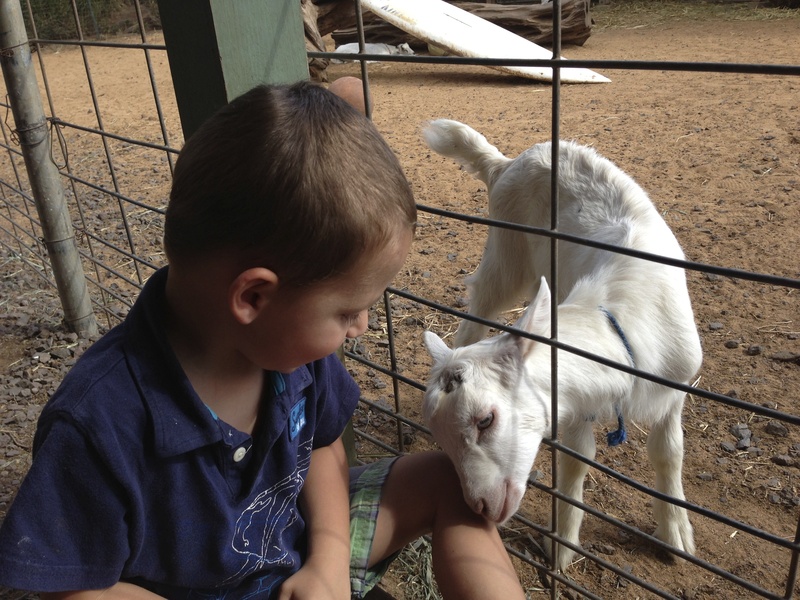 There really is more to goat cheese than I ever knew, perhaps this summer we’ll have to add a goat tour to our list of family activities! One thing is for sure- there’s a lilikoi goat milk cheesecake that I’m dying to try! There’s even a nice shady seating area to enjoy your cheesy delights. Silly goat, enjoying the views of upcountry Maui. 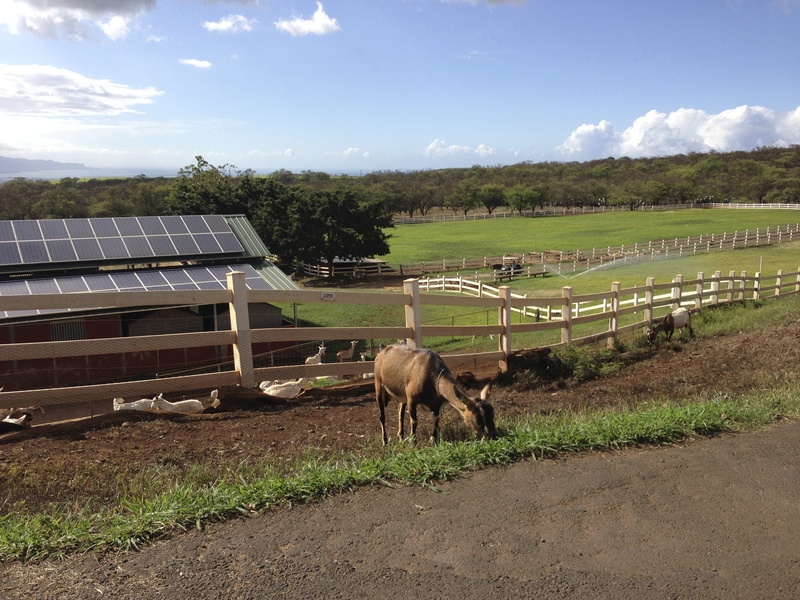 WIth the ample sun on Omaopio, solar panels make sense for the dairy and the distillery!